On the 20th November 2016 a group of 9 B.A. 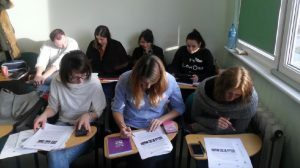 English Philology students and their leading teacher, Ms. Justyna Kowalczys, took part in Piloting activities from the HELP project. The piloted Module 15 “Why do we need intercultural competence in care and healthcare” was given to students in the written version. Additionally, the students were familiarized with the HELP platform. – Video Clip 1 – Jafar – impressive! After having been demonstrated HELP medical modules and after testing one of them (Module 11) the English Philology students were familiarized with the intercultural part of the HELP project. Firstly, the general idea of intercultural training in general fields of life and also in medical environment was presented to the students. They were asked to give examples of conflicts that might arise from intercultural differences, especially in present political and economic EU situation. The students were creative in listing hypothetical situations, yet they claimed that they only discuss the topic intuitively, sometimes basing on their own experience. What is important, however, they unanimously claimed that they lack professional training and materials in this field of study. Therefore, they were eager to be presented and to practice HELP intercultural modules. All the presented exercises proved to be “food for thought” and stimulated a lot of discussion and personal involvement of the students. However, the peak was reached after watching two short videos: Jafar and Don’t judge a book by its cover. Even though they do not include lengthy dialogues and the storyline seems basic, there are much emotions and questions evoked. The students were shown Module 15 and tested it on two levels – they were shown the modules on the HELP platform and additionally all the students were handed in the pdf written versions of the module. The paper versions of the questionnaires were filled in after having completed the module by 9 students. All of the participants agreed to receive the HELP newsletter. – The B1/B2 level is adequate for students with B1/B2 general English level, as well as for learners with C1/C2 general English. – It is a comprehensive tool to support group and individualized form of intercultural study. – Individualized self-study with the moodle platform was appreciated; it is a new tool to this group of students. – All the students declare to use the platform as a form of linguistic and intercultural self-development. – Students declare to cover all speaking exercises when they learn individually as they have many international contacts/friends and colleagues from the same profession. They also feel that linguistic correctness will be interchangeably checked. – The group agrees to use the pictures taken during piloting on the HELP website. – It is advisable to number all pages in pdf version of every module, as a printed copy creates confusion with the right ordering. The general feedback was very positive. After the students were made familiar with the topic of intercultural training they suddenly realized the lack of this issue in all the training materials they ever had. Additionally, they admitted that I am the first teacher ever mentioning this topic to them during regular classes. The overall comments about the project’s idea and intercultural modules were very supportive and full of admiration (Super, It’s very interesting, Great job, Great idea, Interesting, Useful and helpful for students, patients, nurses). All the students declared very high overall satisfaction with the module (7 questionnaires – 6 points, 2 questionnaires – 5 points).